Letter from Forderick Kassen in Glenwood, Iowa, to Your Excellency. 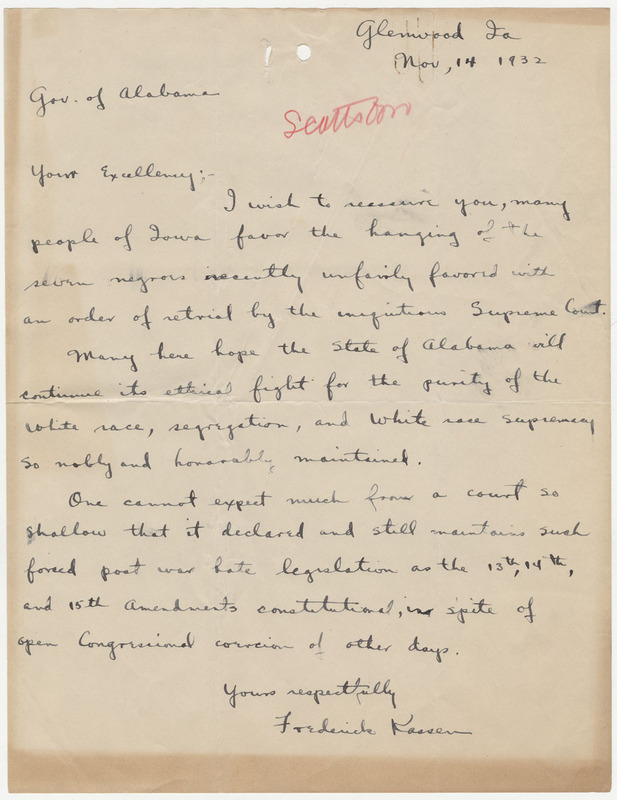 Forderick Kassen assures Governor Miller that people in Iowa, and people outside of the Southeast in general, want to see the Scottsboro Boys hanged, though the United States Supreme Court has ordered a retrial. He hopes that Alabama will continue its "ethical fight for the purity of the white race, segregation, and white race supremacy." He does not respect a court that upholds "hate legislation" like the 13th, 14th, and 15th amendments. an order of retrial by the iniquitous Supreme Court. so nobly and honorably maintained. open Congressional coercion of other days. 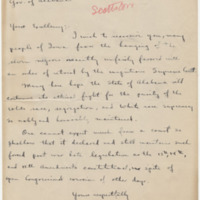 Kassen, Forderick, “Letter from Forderick Kassen in Glenwood, Iowa, to Your Excellency.,” Scottsboro Boys Trials, accessed April 23, 2019, http://scottsboroboysletters.as.ua.edu/items/show/503.